A Short Introduction by the Author, Miss Victoria: What country do you love the best? Well, I would most certainly hope you would say it was yours; I know I most certainly do! This is a tale about my ordeal in the most backwards eastern nation I have ever been too, Czarina. It focuses on my dealings with rude brutes and how I tried to civilize them, while merely trying to buy something for my hobby of machine building. Deep in the valleys of the world, there are a places of steam and magic, airships that roam the skies, with pirates and other tales of such romanticism. Now, we know some say that such a land is just a fairytale, and it's just an image in every kid's head but that’s not the case here! Our world is made up of vast amounts of seas, mountains, and other obstacles. However, we’ve found ways of amending this issue! With the invention of airships with a constant supply of a magical energy called Unattainium, we cantravel long distances over short periods of time. It’s simply impressive! The heroine of this story is named Victoria, be sure to address her as Miss. It is very prudent that you do! You may have heard of the exploits of her two famous siblings Sir William of Pondbridge and Sir Hector of Rosemoor. Miss Victoria is not vain enough to say that she is anything like her brothers, but she is always looking for people to help her out on her quests. Miss Victoria is on a journey looking for parts and machines to create a new kind of steam powered machine that the world has never seen before. You may join her if you like, or you may be her foe. But you will not stop her. Yes, She knows there’s 'issues' happening in Czarina. Some evil doctor and his group of scoundrels, dead beats, thugs, and wankers that goes by the name of the Q Syndicate have been waging a conflict with the imperial court of Czarina. Miss Victoria and her team have to head down that way to get what she is searching for. Figures, doesn’t? This journey will not be easy. You will have to face dangers, but, as long as you believe in your dreams, no one can stop you! Age: A proper woman never reveals her age. However, she is 21. General Appearance: Victoria likes to wear a lot of whites, enough though it's not a good color choice with all the coal involved with steam but then again she is not the one shoveling it...She always has a pistol on her side and grenade or two hidden in pockets. She wears high boots, since that is the fashion for officers in military. Of course, since Victoria is a lady of class she will not wear men's clothing; however she tries to keep things but practicable and well defined for her gender. Current Goal/Purpose: Her goal is to collect rare ancient artifacts that were stolen from the Ottomans in the 1500s. If she can add them too her collections, she will be able to create a new machine that she has been dreaming of making for years. General Personality: She is not a Distressed Damsel. She doesn't sit around waiting to be rescued. She doesn't only plan how to rescue herself but others as well. She doesn't talk/manipulate/charm her way out of problems. It is unlikely that she would ever use her own hands to defeat an opponet since that is too brutish. It has to be a refined weapon, like a bow or rapier. However, Ms. Victoria is more likely to prefer a revolver with deadly aim, as opposed to an automatic since it is more graceful than an automatic. Basically, Miss Victoria retains an air of grace and reserve not usually associated with violence. She does have her own charm in a cool, collected, Nicole Kidman way. 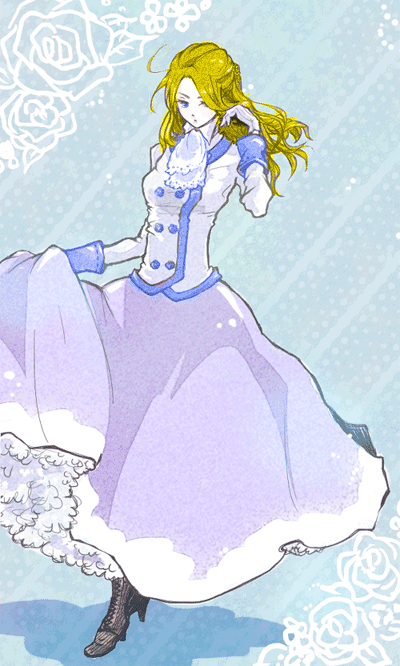 Miss Victoria can be seen as arrogant and prissy, but she is not an ice queen. General History: She is the daughter of nobility in Britain and sums up her early life. Miss Victoria is well educated in modern sciences and is therefore often hired by world musuems to help add to their collections. Victoria is the youngest sister in a set of four siblings. Her eldest twin brothers, Sir William of Pondbridge and Sir Hector of Rosemoorare well known explorers in the world. Her current shop was built upon her father’s old clock repair shop, where she learned the basic concepts of gears and moving parts. Expanding upon this knowledge, she decided to learn how to operate larger machines since the interchangeable parts system is very much similar to what she was used to doing. As of late, she is being funded by a branch of the British military that wishes for her to create a "new machine of great power."